Beautiful, bright and sunny remodeled/updated Rancho San Miguel Eichler home that keeps true to the mid-century modern style. 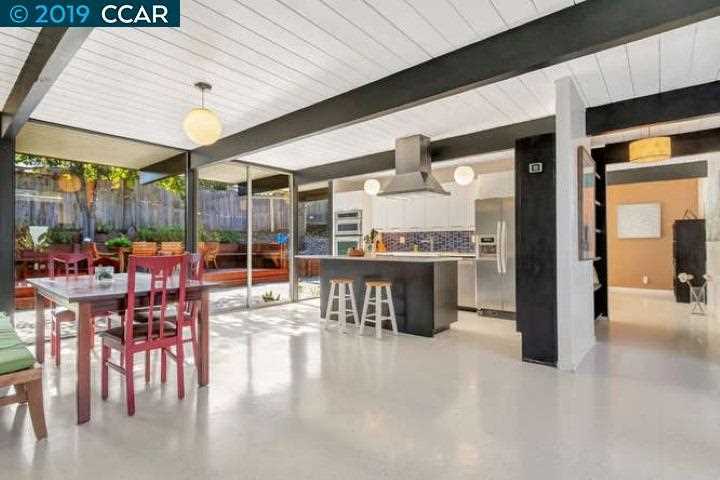 Many original Eichler improvements are in place such as globe lighting, radiant heat, floor to ceiling windows and sliding doors, wood beams, and Eichler siding. The bonus room can be used as a 5th bedroom or office; there is also a laundry room and a large central atrium. Updated bathrooms, remodeled kitchen, updated electrical panel to 200 amps, newer flooring, and newer tankless water heater for radiant heat and house water. Excellent location on a quiet street near John Muir Hospital, with easy access to numerous trials and open space. Rancho San Miguel Park, Heather Farms Park and RSM Swim Club are within walking distance. Shopping, restaurants, and transportation, including BART, are conveniently located nearby. Eichler fans will not want to miss this one - indoor/outdoor California living. SchoolsClick map icons below to view information for schools near 183 Los Cerros Ave Walnut Creek, CA 94598. Listing provided courtesy of John Berger, Better Homes And Gardens Rp. Home for sale at 183 Los Cerros Ave Walnut Creek, CA 94598. Description: The property at 183 Los Cerros Ave Walnut Creek, CA 94598 with the MLS# 40850626 is currently listed for $1,085,000 and has been on the Walnut Creek market for 93 days. You are viewing the details of the real estate listing from the East Area MLS at 183 Los Cerros Ave Walnut Creek, CA 94598, which features 4 bedrooms and 2 bathrooms, and has approximately 1742 sq.ft. of living area.